Merchants offer their windows for painting and kids coming out to paint them. What could be better? 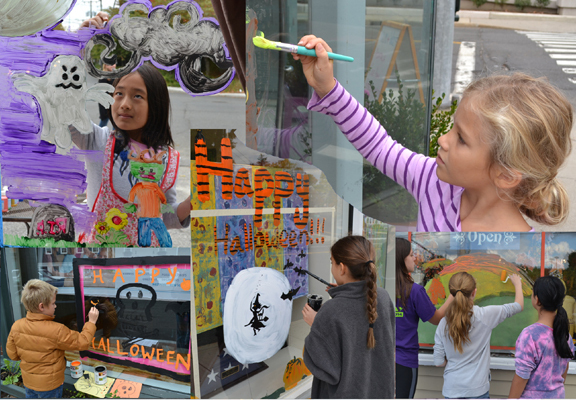 On Saturday October 27st, between 9am and 4pm, kids will paint a window requested or assigned to them. Judges will come around in the next few days and determine winners based on three different criteria and age/school (Elementary, Middle School, High School). Thanks. Painting will take place on Saturday and winners announced on Tuesday. Winners receive a gift certificate for Ice Cream from Saugatuck Sweets and an award. Merchants will mark off a 3' x 3' maximum area on their window, prior to the 22nd, for painting and will leave the art work up through Halloween. Winning windows will display the ribbon as well. Merchants are responsible for cleaning off their windows after Halloween. Painters will supply their own WATER BASED paint, drop clothes, brushes and clean up after they are done. Winners will have their pictures taken with the window and have it submitted to the press, as well as receive a $25 gift certificate to one of the participating merchants.